The first German aircraft to be shot down on English soil during the Second World War was brought down by three pilots of 43(F) Squadron, flying out of Acklington and led by the (then) Flt Lt Peter Townsend. 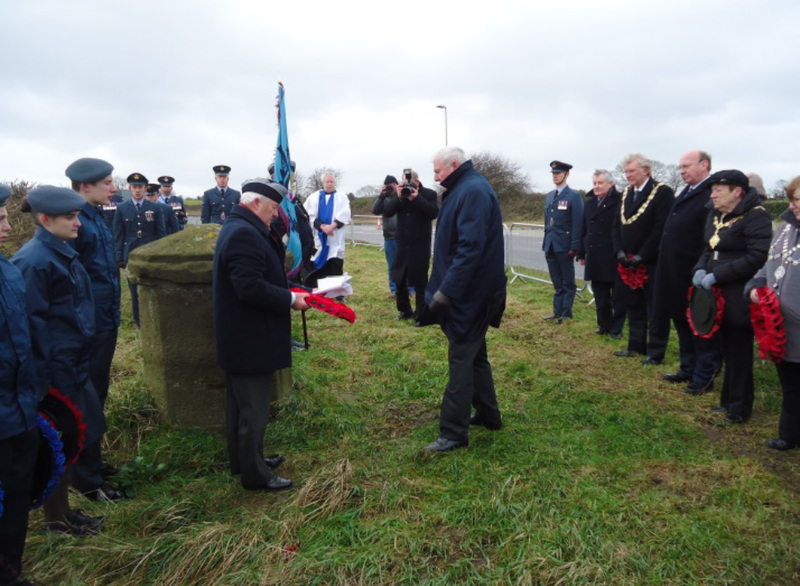 The Heinkel 111 crashed two miles NW of Whitby, and the site of the event is marked by a small plaque on a roadside monument at the junction of the A169 and AQ171. RAFA Northern Area marked the 75th anniversary of this event with a commemoration on Sunday 1st February, attended by members of the Royal Air Force, Air Training Corps, the Royal Air Forces Association, Civil Dignitaries and 43(F) Squadron Association. Your Secretary laid a wreath on behalf of 43(F) Squadron Association. The Strength of the wind is evident ! Personnel from RAF Fylingdales and RAF Linton-on-Ouse, including the Area RAFALO and members of the RAFA Northern Area Council paraded alongside members from the local Air Cadet Squadrons. The Chairman of North Yorkshire County Council and the Mayors of Scarborough and Whitby were also in attendance. Prayers were said, the Last Post played and Wreaths were laid at the Memorial in biting winds with over 40 guests facing the elements to pay their respects. Church of the Holy Rude for Laying Up of the Squadron Standard and Unveiling of the memorial Plaque. Although the Centenary is 16 months away, it would be of great assistance to your committee in their planning if you could let us know if it is your intention to join us at Stirling, and which events you would wish to partake. You may complete the questionnaire SOON. It was with sadness we learned of the sudden passing, on the 26th January, of Andrea, wife of Harry MacLean who served on the Squadron 1978-1981.